Description: Furrin' Poer races to the scene of NS 165's derailment in East Statesville. Description: CSX 4501 rests between assignments at Loyall Yard. Title: Working hard or hardly working? Description: In this case the SD70MAC and the C40-8W are not working at all, the GP40-2 is working hard to drag their dead weight up to Fowler Junction. 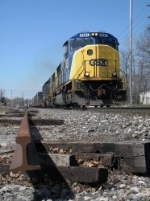 Description: CSX SD70MAC 4501 trails on Q259 South. Description: Along the ex B&O Ohio River Line. Q316(left) runs past a single unit Q317 at the north end of the Low Yard. Description: Q502-30 north along Frankfort Avenue. Description: CSX 4501 leads a southbound mixed freight around the curve into Walbridge Yard. Description: West 1st Street, 1636 hours. Description: Middle unit on a southbound intermodal. Description: CSX SD70MAC 4501 leads Q235 (Louisville Ky. to Tampa Fl.) by the Gaithers (MP 45.3) Defect Detector. CSX 9031 and CSX 461 are trailing.